(Millbrook, NY) Road salt applied during the winter lingers in the environment, where it can pollute drinking water supplies. In a recent study in the Journal of Environmental Quality, researchers identify landscape and geological characteristics linked to elevated well water salinity in a suburban township in Southeastern New York. Victoria Kelly, lead author and Environmental Monitoring Program Manager at the Cary Institute of Ecosystem Studies, explains, "Each year, millions of metric tons of road salt are applied to roads in the US. Some of this salt seeps into the soil, where it accumulates and contaminates groundwater. We wanted to understand why some wells were more at risk than others, to inform management that protects water quality." Kelly and colleagues analyzed publicly available data on water samples taken from 956 private drinking water wells in East Fishkill, New York between 2007 and 2013. More than half of the wells sampled exceeded US Environmental Protection Agency health standards for sodium. Distance to the nearest road and amount of nearby pavement strongly influenced well water salinity. Surprisingly, well depth and road type — ranging from interstate highways to back roads — did not have a significant impact. 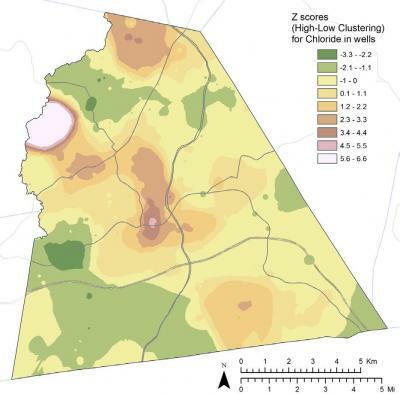 GIS analysis of sodium and chloride concentrations was used to describe the pattern of road salt distribution in the aquifers tapped for drinking water, and to compare surface features in the surrounding area of each well location. The team assessed neighborhood-scale variables, including well depth, proximity to roads, well elevation relative to nearby roads, impervious surface, surface geology, and soil type to discern relationships between development and well salinity. Findings linking pavement and other impervious surface cover to well salinity support a growing body of evidence that development and urbanization cause groundwater salinization. Proximity to a road increased a well's chloride concentration, yet road type – major or minor – did not have an impact. Well depth did not significantly impact saltiness and elevation in relation to nearby roads only affected wells when the roads were more than 30 meters from the nearest well. Several hotspots, where salinization was especially high, were identified. Suggested contributing factors included sharp turns and steep grades that required heavier road salt application, and narrow streets that only accommodate older, less efficient salt trucks. There was only one cold spot, in an area of low housing density, reinforcing the relationship between urbanization, salt application, and freshwater salinization. "Understanding the landscape features that lead to increased groundwater salinization can inform targeted salt application," explains Stuart Findlay, a freshwater ecologist at the Cary Institute of Ecosystem Studies. "The time to act is now, as we know it can take decades or more for the salt currently in groundwater to flush out." Kelly adds, "In planning efforts to minimize road salt impacts, our findings tell us that smaller roads should not be overlooked and areas with a lot of pavement and porous, well-drained soils are most at risk of experiencing salinization. Road salting is not one-size-fits-all undertaking. More targeted approaches will keep roads safe while reducing unintended consequences to drinking water supplies."